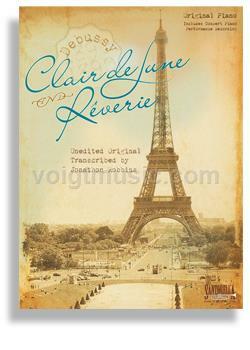 Debussy's Clair de Lune & Reverie is published by Santorella Publications and transcribed by Jonathon Robbins. These un-edited “Concert Originals” are perfect recital, concert and audition pieces for an intermediate to advanced pianist. This magnificent title also includes a performance CD. Its masterpieces exemplify an exceptional display of talent possessed by Claude Debussy and the stylistic impact that he had in moving the Romantic Era towards Impressionism. Clair de Lune, the third and most famous movement from Debussy's Suite Bergamasque, was composed in 1890 when Debussy was 28 years old. However, this masterpiece was not published until 1903. Clair de Lune has been featured in films, commercials, and television shows for decades. It has most recently experienced a revival in popular movies such as Ocean's Eleven & Twilight. It is believed that Debussy was inspired by the Paul Verlaine poem of the same name. The quiet, rolling melody and fantastical nature of the mood it evokes speaks to the dream-like landscape that Verlaine references as opposed to Reverie which is indicative of his stylistic approach. Debussy once said, “Music is made up of colors and rhythms. The rest is a lot of humbug, invented by frigid imbeciles.” No piece exemplifies his conviction better than RÃªverie. Debussy's use of melodic transitions, arpeggios, dynamics and tempo creates a feast for the senses. Though he dedicated much of his life to Orchestral, Chamber & Operatic works, he also left an indelible mark with his compositions for piano. Clair de Lune may be the most popular and recognizable piano work, but RÃªverie is the most colorful and significant example of the Romantic period evolving into Impressionism.